The inauguration of the climate summit is happening right now. This summit comes 115 years since ahead-of-his-time scientist Svante Arrhenius proposed that carbon dioxide in the atmosphere could change the climate.By 1970, an observatory in Mauna Loa, Hawaii, had over a decade of observations showing that Co2 in the atmosphere was steadily rising (the annual cycle comes as the seasons change and plants take in and release carbon dioxide, like a global breath). The cause? Burning of fossil fuels and deforestation. 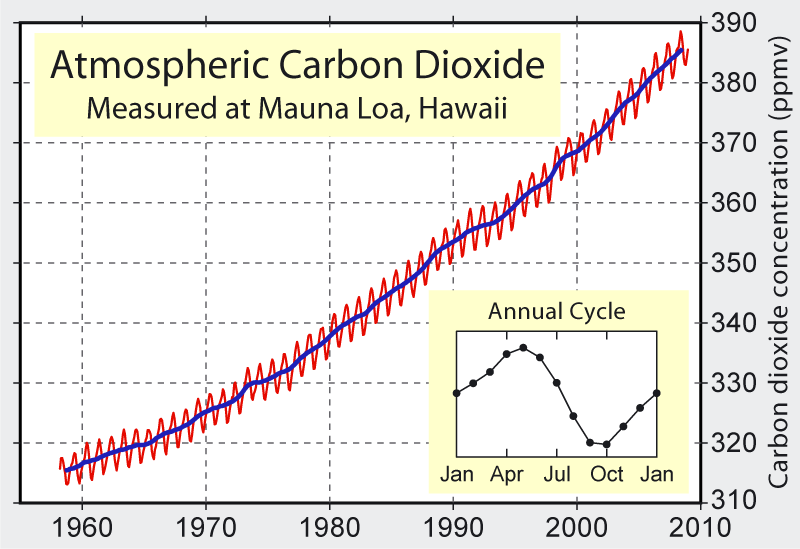 By 1988, the global importance of rising CO2 was clear, and the Intergovernmental Panel on Climate Change was founded to coordinate scientific work on the subject and explain the results to policymakers. The IPCC, and its regular reports are one of the most comprehensive joint science projects ever. Listen to grad student Rachel Pike explain how it works. In 1992,at the Rio Earth Summit, a treaty making process called the UN Framework Convention on Climate Change started to make international agreements to avert dangerous levels of climate change. The industrialized countries pledged to stabilize their emissions of greenhouse gases at 1990 levels by the year 2000. Most lied. In 1997, the Clinton-Gore administration pushed hard for a range of “flexibility mechanisms” to be included in the Kyoto Protocol, most of which allowed rich countries to pay poor ones to make reductions for them. Greenpeace and other international NGOs calculated that loopholes in the Kyoto treaty, such as military bunker fuels, transnational plane flights, and “Russian hot air” (the right of Eastern European countries to claim credit for the emissions they weren’t making after the post-Soviet collapse, and sell it to others who were emitting more), amounted to more CO2 than would be reduced in the first place. Despite this weakening, the US failed to ratify Kyoto, saddling the rest of the world with a weaker treaty not accepted by the world’s largest polluter. Efforts to extend and fix Kyoto continued through annual meetings of the UNFCCC conference of parties (COP), and US efforts to weaken the accord continued even as it ignored the Protocol. Finally, last year, a deadline loomed at COP15 in Copenhagen. The US opted for a second track of negotiations with a handful of highly polluting countries and produced the Copenhagen Accord. The COP as a whole merely “acknowledged” the Accord, and the word “failure” hung in the air. If the UNFCCC process is to be resuscitated, the next chance will be at COP16 in Cancun, Mexico this December. Bolivia, which played a key role from the environmental side in Copenhagen is hosting this week’s World Peoples’ Summit to give the process a push, and create a space for planning both inside and outside strategies on global environmental issues. I’ll be spending a lot of time in the Strategies for Action working group seeing what participants think might be a Plan B if the international impasse continues.